Jim Leyland had plenty to worry about on Saturday, from Jeremy Bonderman's return from a sore shoulder in a morning camp game to Dontrelle Willis and Nate Robertson making their latest outings in the afternoon. So given the questions he has to try to answer this Spring Training, he could be excused if he had a smile on his face as he gave up his manager's chair for a couple of minutes. Ben Meisner studied up for his stint as manager for a day, including what to look for in the camp game, and the Southfield, Mich., native was anxiously anticipating the behind-the-scenes experience of a day at Spring Training. And when someone remarked that Meisner looked comfortable in the chair, Leyland was quick with a reaction. "Well, there are a lot of guys that want that chair," Leyland said. "He might have it." At least he seemed to bring some luck to camp with him for the Tigers, whose 10-4 win over the Blue Jays marked just their second win in their past eight games. The Tigers and Leyland have used the idea of allowing a fan to be a manager for a day as a way to raise money for charity over the last few years. This year's honor was part of a charity auction during the Tigers' winter caravan in January, raising money for the Detroit Tigers Auction. "This is an actual physical experience," Leyland said. "This is a little different from your normal charity thing. That's why I like it." Howard Goldman had the winning bid, but when he realized a few weeks ago that he couldn't make it, he gave it as a gift to Meisner, whose father Irving is a lifelong Tigers fan who took Goldman with him to the 1968 World Series. And the younger Meisner returned the favor by taking his father with him on this trip. Meisner, who lives in Chicago, followed Leyland for much of the day once he arrived in the clubhouse at 8:45 a.m. He took in the camp game with Leyland and Tigers officials and had a chance to observe the evaluation process. "I've never seen the behind-the-scenes stuff," Meisner said. "To see the intersquad game, I was really excited to see Bonderman pitch and see if Bloom could get out lefties. I read all that stuff, but to actually be able to get a chance to watch Dave Dombrowski and Jim Leyland assess that was amazing." Later, as the rest of the Tigers took batting practice, Meisner shagged fly balls in the outfield and chatted with Nate Robertson. 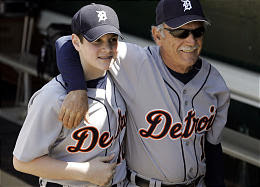 Once the game began, Meisner was seated beside Leyland just outside the Tiger dugout, watching the game and listening to Leyland as he explained some of his observations as the game went along. "The size, speed, talent -- it's amazing," Meisner said. "I've been to 500 baseball games in my life, and to sit next to Jim Leyland and talk about the game (was great). I've watched a lot of baseball, and you think you know a lot about the game until you sit next to someone where that's their job. It was so cool to watch and see how he reacts, watch how he handles people."